Do you need to remove brush or small trees? Get Brush Grubber. Brush Grubber tools are specifically designed for one thing and one thing only — to pull brush, small trees or fence posts out of the ground. They have a simple mission, but they fill an important segment of the market. If you’re reading this you probably have the need for either a tree puller or a brush puller. Well, you’ve come to the right place. We’ll help you find the right tool for your needs. The company BrushGrubber is the manufacturer of the Brush Grubber product line and the parent company is BAC Industries which makes a full range of products such as: logging and chainsaw tools, welding accessories, ATV accessories and much more. Brush Grubber BG-08 makes serious heavy-duty tree pulling tools. Let’s face it, it’s extremely frustrating removing brush, small trees, or stumps left behind from cutting. We use tools for all our yard work but for some reason when it comes to clearing our yard from brush, trees or stumps, we attempt to use shovels and generic chains, often struggling for hours with little progress. You wouldn’t make your own hammer to hammer a nail. Brush Grubber makes tools to make your life easier. Yes, they cost money but these tools are much safer and effective than any of your homemade tools. Whether you need a heavy-duty tree puller or a have a wide variety of brushes and weeds to remove, there’s a tool here for you. One thing I want to clarify is that these Brush Grubber tools are solely for the purpose of pulling and not dragging trees and stumps long distances. For the purpose of dragging trees and stumps you’ll need a log choker or a skidding plate. It’s important to use the right tools for the job. The whole point of using any of these Brush Grubber tools is to save you time, frustration and labor. If you’re looking for an efficient and durable tool for getting rid of your brush and small trees then these are excellent options for you to consider. The BG-08 Brush Grubber is designed to clear brush, tree stumps, and plants. It has 16 gripping teeth to latch on tightly and strong jaws that can opened widely depending on your needs. As you can see, it’s heavy-duty, weighing 11.9 lb. The gripping pads can be rotated 360 degrees. Perfectly suited to pull brush and tree stumps up to 4″ in diameter. It’s recommended that you use this with a tractor, ATV, or UTV. This is true for a majority of the Brush Grubber tools. Forgive me for repeating this fact throughout the article. The Brush Grubber BG-11 will easily pull trees and brush up to 5 inches in diameter. It’s made from heavy-duty 1″ steel with grip pads that rotate 360 degree. They’ve designed it easy to transport by adding large handles. It’s not too heavy at 21.3 pounds, but that tells you how much steel is involved in making this tree puller tool. Don’t worry about it slipping because it has 18 non-slip grip teeth for each pad. This will dig into whatever you need to pull out. 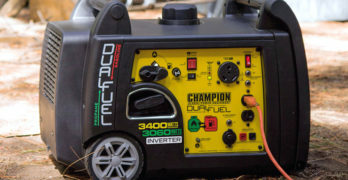 Perfectly suited to be used with a compact tractor 45hp or less, or an ATV, or UTV. If you have the invasive Buckthorn species then this tool will get rid of it with ease. The Brush Grubber BG-25 will pull small trees and brush from ½” to 2 inches. This model has 12 no-slip metal gripping teeth and its spring loaded mechanism will keep your Grubber where you want it. Designed to remove roots and tree stumps. If you’re a homeowner who wants to keep your yard clear and level then you’ll love this tool. Very easy to setup with the included clevis. Can be safely operated and used by one person. It’s recommended that you use this with a tractor, ATV, or UTV. The Brush Grubber BG-20 is one of the the biggest, toughest and strongest of all the brush grubber tools, well, other than the industrial BG-10 post/tree Puller and BG-30 but those tools are in a league of their own. We’ll get to them later in this article. If you have large tree stumps then the BG-20 is the tool you want. I’ll warn you though, this is a heavy tool at 35 lbs so you might get tired carrying and positioning it if you’re not physically fit. I do recommend that you ask for help when using this tool. Either way, it has built-in handles and 3.5″ gripping pads. It’s built to last as its made from 1.5″ steel. This truly is an extreme tool capable of pulling trees straight from the root. BrushGrubber recommends that you use this with any of the following: pick-up truck, SUV, tractor, & skid loaders. The BG-13 Brush Grubber is perfect for those smaller jobs around the yard. This tool is hand-powered so you don’t need to use a vehicle to use it, but you won’t be pulling out any trees with this either. This is great for removing buckthorn, prickly ash, samplings, & all types of annoying weeds. This tool is lightweight at only 4lbs and is designed to pull brush or weeds up to 1″ in diameter. One of the nice features of this particular tool is the large handle for added comfort. The BG-12 is a a chain that attaches to Brush Grubbers. It’s an accessory, not a tool by itself. It’s 6 feet long and is designed to prevent backlash for added safety. It’s 3/8 inch. It’s well built and made to help you pull from a distance. The Brush Grubber BG-30 is designed to use on shallow rooted trees and all types of brush. It works wonderfully on buckthorn as well. Made from 1.5″ solid steel and large non-slip teeth. This is a heavy-duty tool capable of pulling trees and brushes up to 8 inches. You definitely need help using this tree puller as it weighs 50 lbs. This is a solid piece of equipment that will take whatever you throw at it. It’s recommended that you use this with a tractor, ATV, or UTV. The BG-14 Brush Grubber is another hand powered brush and weed puller. It has an 18″ extendable handle with a spring operated jaw. It’s relatively lightweight at 6.4lbs. The nice feature about this tool is that you don’t have to bend over and strain your back when using it. Brush Grubber BG-19-Heavy-Duty Clump Grubber. The Brush Grubber BG-19 is built for those heavy duty jobs around the yard. It’s designed with a unique triple chain system that wraps around clumps and the loop system acts as a choker. This works well on brush and small trees up to 1.75 feet in diameter. It’s 6 Feet in length, with no slip grip links for bigger clumps. This tool will save you time by pulling clumps rather than small individual trees. Brush Grubber recommends that you use this with a tractor, ATV, or UTV. If you want something smaller then you’ll be interested in the lighter-duty BG-16 shrub/clump Grubber. Brush Grubber BG-10 Post Tree Puller. The Brush Grubber BG-10 is a tree puller. That’s all it does and it does it well. But you’ll need to connect it to a the fork of your skid loader or tractor. It’s very heavy duty and is also designed for steel posts as well. It has a unique design that prevents slipping while you’re pulling. This is a beast of a tool at 160lbs but it’s made for serious tree pulling. Definitely not for the average homeowner. BG-02 Metal Handled Brush Grubber. The Brush Grubber BG-02 isn’t the best tool for pulling weeds but I’ve included it here just for reference. It has 20 steel teeth to grip with spring loaded jaws. It’s made for small brush and weeds up to 1.5 inches. I recommend the incredibly popular Uproot Weed and Root Remover instead. The Fiskars Uproot Weed and Root Remover tool is much better for removing common weeds and roots. It’s extremely well designed and far superior to the Brush Grubber BG-02. I’ll be doing a full feature article on the Fiskars Uproot Weed and Root Remover shortly, but until then, I’d like to introduce you to the tool. The UpRoot Weed and Root Remover is designed to simplify the process of removing invasive plants from your yard without straining your back or having to kneel down, and more importantly, by eliminating the need to use herbicide or other toxic chemicals. It’s designed with 4 serrated steel claws that grab the weeds by the root and allows you to have a clean removal from the ground. Not only that, but there’s a clever built-in release mechanism to simplify the entire process. Fiskars makes fantastic products and I’m a big fan because of their commitment to quality and their lifetime guarantee. You can learn more about Fiskars by reading my comprehensive article on their splitting and chopping axes. Read the customer reviews on the Uproot Weed and Root Remover and decide for yourself. With over 1200 reviews the Uproot Weed and Root Remover has an impressive rating of 4.5 (out of 5).